Something doesn’t feel right. You know it the minute you walk in the door. You might check all the doors and windows to make sure someone didn’t break in. You’ll also look under the beds and in the closets, feeling slightly foolish for doing so. The unsettling sensation will probably drift away after a while, but returns the minute you slip into bed and turn off the lights. If your house truly is haunted, you might also feel as though someone is watching you during odd moments of the day. Items will probably disappear, only to reappear somewhere else. Footsteps will be heard in empty rooms or you might catch a glimpse of something moving quickly out of the corner of your eye. While most ghosts are nothing more than earth-bound souls who haven’t found their way to the light, it’s still unnerving to share your space with a ghost. Here are several methods of removing a ghost from your home. Most religious leaders are happy to bless your home providing you are a member of their church. Having the backing of the church behind them can make a difference. If the ghost was once human, they might remember this from their living days and respect the wishes of the clergy. Start by calming down the energy. Purchase white sage from your local metaphysical store. It can be mixed with cedar or sweet-grass for good effect. You should know that sage isn’t a cure all. You can’t just walk from room to room burning it and expect it to remove all the ghosts. Think of it more like “Ghost Valium.” It quiets the spiritual energy, making them more willing to abide by your wishes. This is a good first step and may be enough to solve the issue. Ghosts don’t always understand they can’t come with you. When you claim your space, it lets them know they can’t just move in with you on a whim. Before you begin, open a few windows in your house. Light the stick of sage and then blow it out once it starts to provide smoke. Ask your Spirit Guides or guardians to help you. Fill every room in your house with the smoke, starting with the outermost corner, working your way to the front of the house. Let the sage smoke cover every inch of space in every room, from floor to ceiling. Some say the smoke is calming to them, helping them transition to the next plane. As you burn the sage, tell them you’re filling the house with light and love, and that no negative energy can remain. Tell them this is your house and you are taking it back. Encourage them to find the peace and love they desire through the white light. Tell them it’s time for them to go. Some people will say a prayer as well. When you are finished, extinguish the sage stick on the front walkway. Cut your ties. You can do this physically, as well as mentally. Cut the cords that connect you to this energy, and then move on. Don’t think about it. Shove it out of your mind. Thinking about it could actually draw them back in, so avoid this as much as possible. Some people follow this up with a ring of sea salt around the border of the house. If this isn’t feasible, sprinkle it on the windowsills and doorsteps. This seals the property and prevents negative energy from returning. Some will also create a spiritual boundary by spraying their walls with Holy Water. Others will also take a warm bath filed with sea salt and lavender, to cleanse their body of the energy. Imagine yourself as a ghost therapist. Talk to the energy and tell them about the white light. It opens up when we die and we are supposed to cross through it to get to the other side. Some people call this place on the other side Heaven or the Kingdom. It is a wonderful place, filled with all their loved ones and relatives who have passed on before them. Tell them it’s okay to cross over. Often, souls balk at crossing over into the light at the time of their death. They begin to wonder if they were good enough in life to earn passage, fearing they will take an elevator directly down to fire and brimstone instead. This isn’t the case. Everyone is allowed to cross over. While they might not like the ramifications of their misdeeds, they aren’t sent directly to Hell. Some misdeeds aren’t misdeeds at all. They are considered a human condition. Tell them they are forgiven, that God loves them and welcomes them. Urge them to find the light and cross over. They can call out to their ancestors to help pull them through or to look for someone else’s white light to pass through. Funeral homes and churches are good places for them to look. Most souls linger around to attend their own funeral, perhaps checking out the attendance, and won’t cross until the service ends. Several members of my Paranormal 101 class and I have been helping souls cross over by using this technique. We simply talk to them as though they are people standing in front of us. In several instances, we’ve been highly successful, which is the best possible solution, in my books. Don’t investigate your own home. I’ve been called to several homes only to discover the homeowner is actually pleased with the haunting. Basically, I was invited over so she could show off her ghosts to me. If this is the case, please don’t call me. I see enough ghosts on a daily basis to last me a lifetime. I don’t need to meet yours too. If you continue to poke at them, trying to get a great EVP or photograph to show your friends, they aren’t going to go away. They might like the attention and decide to stay on for an extended period. Or you could make them angry, which is often the case. Ghosts were people too. Remember this as you attempt to exterminate them from your property. Chances are: your house was once their house. They might have built it themselves and have a personal interest in how it’s maintained. Sometimes simply informing them of upcoming maintenance or home-improvement projects can go a long way in easing their fears. 5. Research the History of the House. Go to your local town hall and look at the census records and death records to find out if the ghost is a former resident of the home. Sometimes a tragic event could have caused them to stay behind, or maybe they’re just attached to the house. Sometimes just knowing what you’re dealing with helps move them on to the other side. After you’ve figured this out, return to step 3 and work on counselling them. Allow the energy to calm down on its own. Don’t acknowledge them and don’t be fearful. Just go about your life as usual. Sometimes this simple action makes a difference. Unless they pop up in my face, I don’t pay any attention to them. I pretend I don’t see the cats staring at the spot above my bed. I dismiss the rapping sounds on the walls I refuse to give it any energy, which ultimately feeds it and gives it more ability to continue. Sometimes, they grow bored with me and drift away. The last resort, which I don’t think is a good one, is to move. I don’t like this last option, because you are only leaving the problem for someone else to deal with. Or worse, you go through the effort of moving, only to discover the ghost has followed you. Dark energy attracts dark energy. If your life is in shambles and you live each day dreading the next, you are likely to attract more than you bargained for. Negative entities love nothing more than feasting on your misery. Get out of your house and go for frequent walks. Open the blinds every day and let the sunlight in. Find good reasons to live your life and make changes so it becomes second nature. For me, this made a huge impact. I’ve always considered myself to be a positive person, but I sometimes let past hurts affect me. One psychic medium I went to said she saw a dark spot on my aura and told me to let go of the past. Advice like that is often easier said than done, but I did take her words to heart. Once I finally let go of the traumas from my past, I discovered that my vibration increased and dark scary entities stopped following me home. Sometimes drastic situations call for drastic measures. Some ghosts are resistant about moving on, so the typical measures aren’t going to work with them. If you’ve done all these things, but still continue to have paranormal issues, you will need to pull out the big guns. . Understand that this is more than you can handle on your own and find a psychic medium to help you. There may be more going on than you know. If the ghost is advanced and is negative, you don’t want to handle this by yourself, especially not the first time. Find someone who has experience removing negative energy. An experienced Psychic will be able to determine the type of haunting and help you find the correct measures to deal with it. If you suddenly went blind in one eye, you probably wouldn’t go to the pharmacy and ask the sales clerk for help. You’d seek out an optometrist. The same theory applies to extreme hauntings. After years of having negative entities follow me home and disrupt my life, I finally found people who could help me. Both of them are psychic mediums. One of the mediums began teaching me how to protect myself, something that could help me in the long run. The other one removed the ghosts from my house when I could no longer handle them. People like this do exist and are often willing to help you. For me, finding them was the hardest part. If you find this to be your reality as well, contact your local metaphysical shop or look for a psychic medium groups on social media sites. Ask friends for recommendations and keep searching until you find someone. Always keep in mind that most ghosts were individuals, and every method isn’t going to work with every ghost. The more resistant a ghost is, the harder they are to move along. Always start at the beginning of the list and rule out normal explanations first. You will save yourself a lot of time and stress. When I went through this myself back in the 1990’s, I wasn’t sure what to do and the resources weren’t as prevalent as they are today. I ended up moving out, leaving the energy for someone else to contend with afterwards. I later learned that the house was sold five times in five years, and it made me feel very guilty for not pursuing it further. Whatever you do, do it with purpose and remain calm. Fear is never a good tool for working with ghosts, and neither is anger. Most hauntings are human in nature and a sense of compassion is your best ally. What if the Haunting isn’t Human? 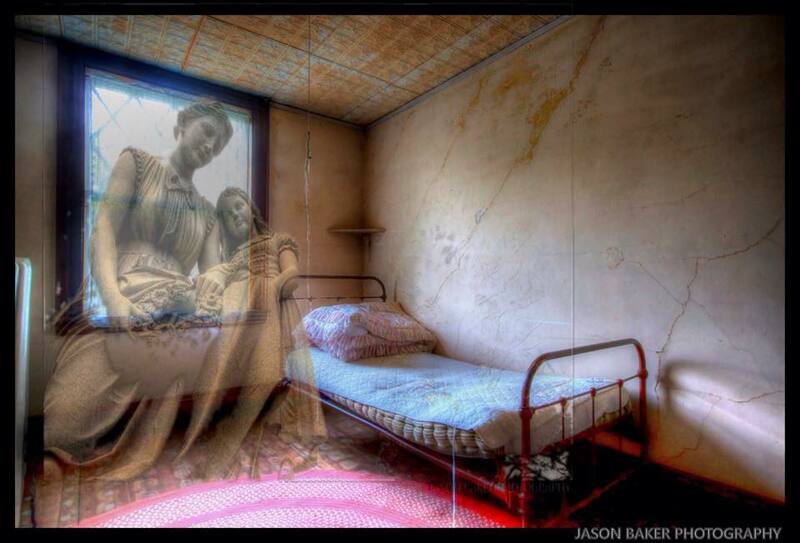 When we talk about a non-human haunting, we are usually talking about a demonic situation. While these are rare, they do exist. Signs of a non-human haunting will range from foul smells in the house and abrupt personality changes to unexplained scratches on the body. Demons don’t possess locations, they possess people. They only hang out at a location to stalk the perfect victim. If you suspect your haunting isn’t human, find a professional to help you. I would recommend a combination of efforts. Seek out a trusted psychic medium, as well as a member of clergy. The medium will help act as a go between, letting the others know what is going on. A member of clergy, preferably a Roman Catholic Priest, will conduct an exorcism. Don’t allow someone to perform this unless they have a proven track record. This isn’t the time for someone to be learning a skill, especially if your life is at stake Always believe it will work. Faith and a firm sense of belief will carry you much further than doubt and fear. If you enjoyed this article, you can find more information just like it in my new book Dark and Scary Things, available in paperback or eBook on Amazon.com (click here) or on BarnesandNoble.com (click here). Joni Mayhan is a paranormal investigator and author who lives in central Massachusetts. If you enjoy reading about the paranormal, you might also enjoy her other paranormal books, Bones in the Basement – Surviving the S.K. Pierce Haunted Victorian Mansion, The Soul Collector, or Devil’s Toy Box. You can click on any of the covers below to learn more about them.